It was the beginning of 2016 when Thomas Farthofer, after many years in asset management and investment banking, decided to leave Vienna, Austria for Hanoi to help as a volunteer. While teaching at different universities and a secondary school, he fell in love with the country and its people. Their honest hospitality, openness, friendliness and their positive spirit left a strong impact on him. On his flight back to Europe he decided he wanted to return and provide more sustainable help. Thomas’ vision was to build schools, access to basic education, in some of the poorest and most remote villages in Vietnam that were not receiving the support they needed. These remote areas are mostly populated by ethnic minorities and access to education seemed like the most efficient way to break the cycle of poverty, which many of the local children are caught in. Two months later he returned to Hanoi to look for local partner organizations whose support Sao Bien considers as one of the cornerstones of their concept. “It’s the cross-border cooperation with local partner organizations that allows us to leverage on our own strengths in project management and fund raising, while benefiting from the local expertise and network of Vietnamese organizations,” explains Rüdiger Rücker, Sao Bien’s President. Rüdiger is one of three Vienna-based board members, overlooking administrative and legal aspects, while Thomas, who is based in Hanoi, oversees daily operations. During many exhausting field trips Thomas was able to better understand the challenges the ethnic minorities in the mountainous areas faced. All the school sites were close to the border with China or Laos, and governmental security rules require pre-registration with the local authorities. And because of its remote location and a lack of infrastructure, the sites themselves can usually only be reached by motorbike and then walking the last few kilometers. Thus, transportation is very challenging and could not be done without the help of the locals who carried construction materials to the site. The involvement of the locals was an important element, not only to solve the transportation issue but also to raise their identification with the project. “We get local authorities and local people involved from the very beginning,” says Thomas. Sao Bien’s innovative approach has helped it win the Audience Award of Sozialmarie 2017, Europe’s oldest prize for social innovation. The close coordination with the local authorities also ensures that each school matches exactly the specific needs of the village in terms of facility size and layout. Furthermore, agreements with the local authorities ensure proper use of the schools after completion, including teacher recruitment. 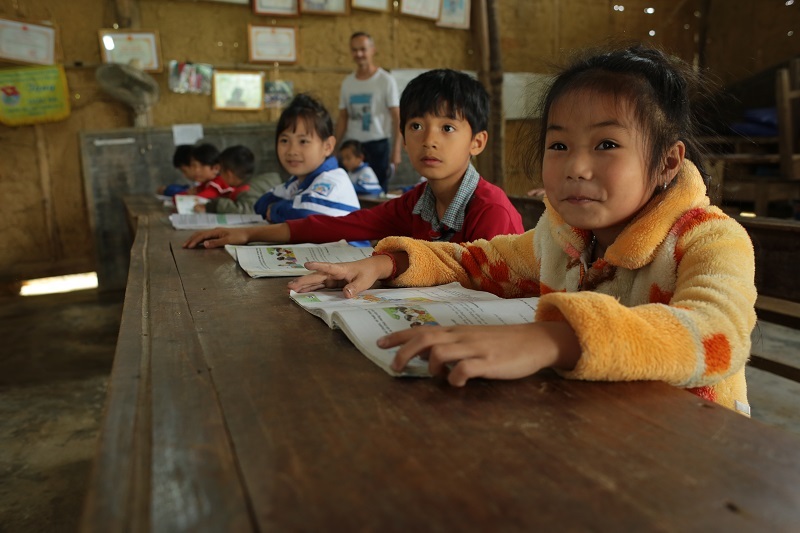 So far, Sao Bien has completed seven schools. 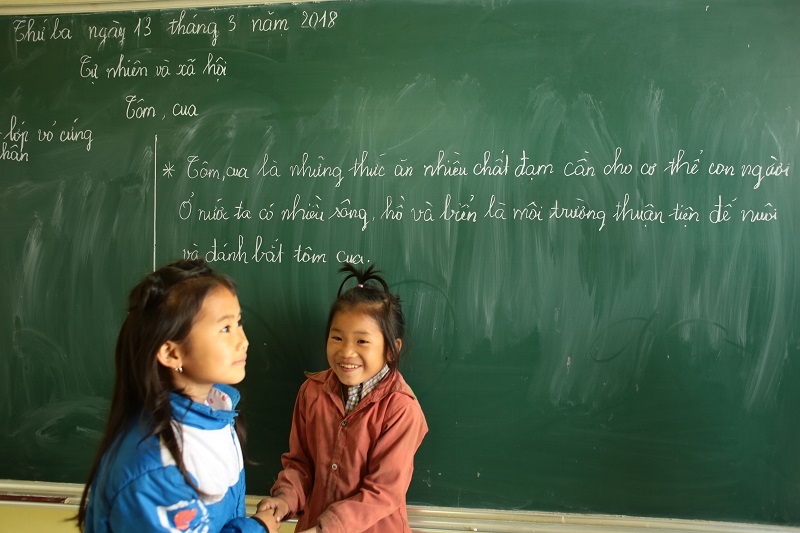 This year’s project pipeline includes another seven schools in the provinces of Dien Bien, Ha Giang, Thanh Hoa, Nghe An, Tuyen Quang and Lao Cai. A typical school has two or three classrooms, a teachers’ room (this is often essential because the teachers have to stay in the village during the week) and toilets. It usually grants access to quality education for around 40 children, and the expected lifetime of the structure is 20 years or more. The total project costs approximately ~10,000. In their latest projects, Sao Bien started to install solar panels in villages that often have no electricity. Aspects of sustainability will play an even bigger role in their projects in the future, says Rüdiger. A wide variety of funding sources are tapped to realize these ambitious plans. A large portion of donations come from Austrian citizens, with corporates and social enterprises in France, Canada, Switzerland, Austria and Vietnam also providing steady support.